Every mother’s milk is unique. Test your own milk. 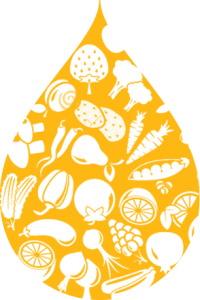 We focus on the nutrients that are important for you and your baby. Key breast milk vitamins are primarily affected by current maternal diet. These can be improved with maternal nutrition or vitamin supplements. Low levels of group 1 nutrients in breast milk may cause deficiencies in the infant. Vitamin B6 functions as a cofactor in the metabolism of protein, fat and sugars. It effects the infant’s growth and is required for the development of the brain. Low Woman whose diets are short of animal food sources are at higher risk of developing inadequate levels of B6 vitamin (alongside with B12 and A vitamins). Suboptimal maternal nutrient intake can result in low milk nutrient levels. Low Vitamin in breast milk can lead to further depletion of infant stores and can have undesirable health and developmental effects on the breastfed baby. Insufficient intake of vitamin B6 was associated with growth delay in infants and severe deficiency is associated with neurological symptoms and seizures. According to the CDC about 10% of the population in the USA aged 20-35 has a clinical deficiency of vitamin B6, and hypovitaminosis or subclinical deficiencies are expected to be common. Vitamin B12 is required for the formation of red blood cells, has a function in the synthesis of myelin for nerves and is critically important in the functioning of the nervous system. The reserves of vitamin B12 in the neonatal liver are sufficient for a few weeks, after which infants must receive this vitamin from their mother’s milk. Unsuitable levels in the milk lead to depletion of the infant’s reserves. B12 deficiency can cause developmental delay. Deficiencies may be caused due to vegetarianism or veganism, autoimmune pernicious anemia, celiac disease, Helicobacter pylori, Crohn’s disease, gastric bypass, partial ileectomy, eating disorders, or use of proton-pump inhibitors, histamine2 blockers, metformin, or nitrous oxide. Babies to deficient mothers have less stored B12 and can develop a deficiency within the first year of life. Extreme maternal deficiencies, which stem from vegetarianism or veganism or undiagnosed anemia, are a known risk factor for the development of deficiencies in the breastfed infant. Infancy is considered as a vulnerable period for deficiencies in vitamin B12. Breastfed infants are at risk for a deficiency in vitamin B12 even if the mother does not show vitamin deficiency symptoms. Studies show that clinical deficiencies in the breastfed infant may result from low levels in the mother’s milk, even when the mother herself has normal levels of the vitamin in her bloodstream.The mother’s status before and during pregnancy is associated with the state of the reserves in the infant at birth. However, all cases of clinical deficiencies in infants were reported in exclusively breastfed infants. Vitamin B12 in human milk is associated more with the current consumption by the mother rather than the vitamin reserves in her body. Vitamin A (Retinol) is a fat-soluble vitamin that is required for the proper development and functioning of the vision system and the immune system. Retinol stores are formed primarily in the last trimester of pregnancy and therefore preterm infants have lower reserves. In any case, an infant is born with small reserves that are sufficient only for a few days, and the toddler needs the vitamin in his diet (as an answer to daily consumption and for forming reserves for childhood). Levels in the breast milk correlate with maternal consumption. Human milk is considered as a good source for the vitamin, and clinical deficiency of vitamin A in breastfed infants are rare. However, if the mother has a low vitamin status, subclinical deficiencies, which are defined as levels that provide the daily needs but do not allow for the formation of reserves, can be developed in breastfed infants. Such depleted status correlate with susceptibility to infancy and childhood infections (6 months – 5 years) and put the infant at higher risk to develop vitamin deficiency at weaning. Thiamin (vitamin B1) a cofactor for the activity of enzymes that are involved in the functioning of the nervous system and muscle, and which has a function in the metabolism and the formation of energy. Clinical deficiency in breastfed infants is reported in developing countries but is very rare in developed western countries. Severe thiamin deficiency causes infantile beri-beri, with neurological symptoms. Subclinical vitamin B1 deficiencies exist in various regions in the world, and may be reflected by unspecific early symptoms. Riboflavin Vitamin B2: a coenzyme in the processes of energy production in the body. Pregnant or lactating women who rarely consume meats or dairy products (such as those living in developing countries and some vegetarians in the United States) are at risk of riboflavin deficiency, which can have adverse effects on the health of both mothers and their infants. Deficiencies are common in third world countries, but there is no evidence of a clinical deficiency of the vitamin in breastfed infants in developed countries. Subclinical deficiencies are more common, but their health consequences are unclear. Caffeine, A stimulant psychoactive substance, is transferred in small quantities to human milk. Increased maternal consumption of caffeine may lead to signs of stimulation in the infant such as alertness, restlessness, widely open eyes and insomnia. Newborn clear caffeine at a low rate and they store the caffeine in their bodies. Health authorities recommend consumption of less than 300 mg of caffeine per day (less than 3 cups of coffee) for pregnant and breastfeeding women. caffeine sensitivities are individual and vary among different infants. Caffeine sources are not restricted to coffee, and caffeine is also found in soft beverages, energy drinks, tea and chocolate. Fat and calories. Fat is the major source of energy in breast milk. Healthy babies, when truly breastfed on demand, balance their energy requirements and caloric intake, by balancing the quantities and frequency of feeds. breastfeeding pattern and baby weight-gain are linked to efficiency of milk transfer and the fat percentage and calories of the breastmilk. Milk fat and calories are usually unaffected by mother’s diet. MyMilk tests identify the levels of key vitamins and nutrients in breast milk. Those nutrients are primarily affected by current maternal diet (rather than the mom's bodily vitamin stores). These can be improved with maternal nutrition (food and vitamin supplements) and health status.Mymilk enable you to get your own breast milk nutritional facts and personalized diet recommendations based on your own milk composition and your habit and diet information. All from the comfort of your home, through mymilk platform. 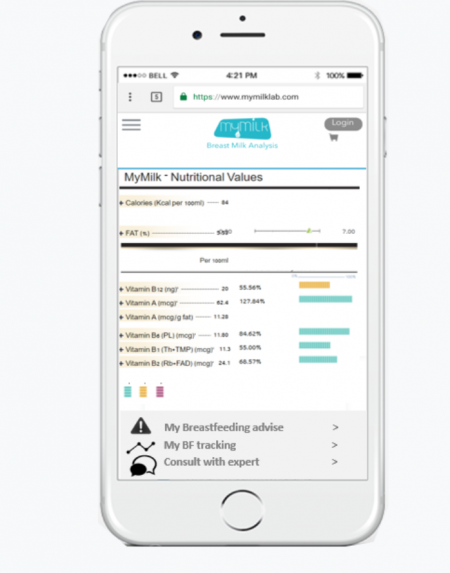 Mymilk nutritional reports give you information regarding your breast milk nutritional facts with personal dietary recommendations, based on your diet and habit information. We built our results so you can understand them. Breast milk results: Lean about your milk results and what it means. Test indicate the levels of key vitamins (priority 1 vitamins), as well as your milk fat and energy. Personal insights: Take action. Find your food and supplement recommendations, based on your milk analysis and diet and habit information. Read carefully segment: learn How to use this test, and what the report can and cannot tell you. According to our data, 1 in 3 breastfeeding moms has relatively low vitamin B12, B6 or vitamin A levels in their breastmilk. Every mother’s milk is unique. Take control over your own milk composition. 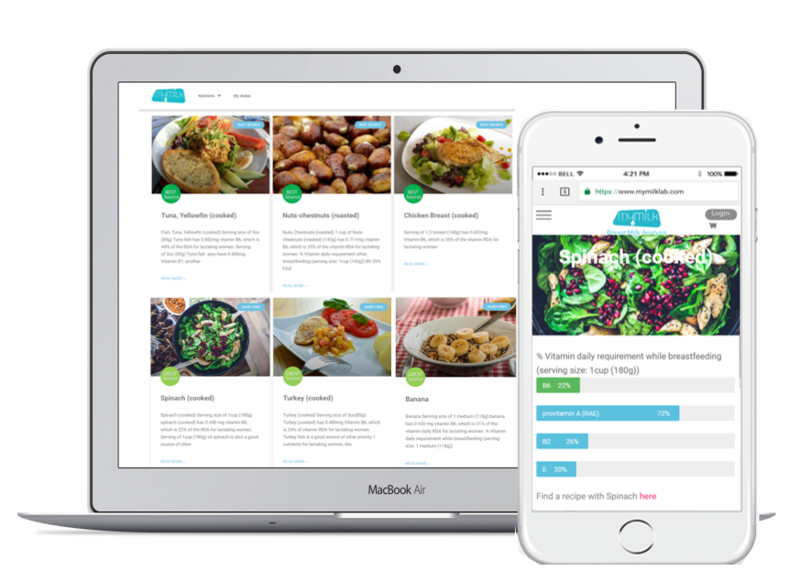 Get nutrient rich food sources and personal dietary recommendations, based on your breast milk results and diet and habit information, to help you achieve your goal as a breastfeeding women. because your milk is the most important food in the world. 1 in 3 breastfeeding moms has relatively low vitamin B12, B6 or milk vitamin A levels in their breastmilk. Learn about your personal milk composition. The test is intended for exclusively breastfeeding moms, between 4 weeks and 6 months post delivery. This test is not considered diagnostic and does not qualify for diagnosing or rejection of medical conditions.